This 2016 summer release is a doozie. I have so many mixed feelings, so let me just unpack them. Fern and Edgar are the children of wealthy New Englanders, living a life of ease with their three children when they learn Fern's family money has run out upon the death of her parents. This news sends the couple careening in different directions as they grapple with the choices they must make about their family's future and the changes their decisions will necessitate in their lifestyle. Fern and Edgar each split off on trips with a different person who is not their spouse, leaving their 9-year-old daughter and twin 6-year-old sons to fend for themselves. This is children plot line is absurd. Each parent assumes the other is with the children and are not communicating with each other or the children themselves. These are people who are otherwise presented as sane, rational humans, albeit facing difficult decisions. I just did not buy it. There were other, more minor points with Fern's parents and her travel companion that were also not-too-convincingly described, the this children plot line was an absolute mess. Nevertheless, I enjoyed the excursions into Fern and Edgar's minds, and those of their parents, as they navigated how to live their lives of privilege. Their musings and thought processes are well-written and provide an interesting topic for thought and discussion. The story is told in alternating timelines, which is always confusing on audio, but the background is doled out in bits that tie to the main characters' current musings such that I didn't find myself hopelessly lost. Definitely readable on audio without losing the story or what makes this book tick. Verdict: Jury's out. There is some interesting food for thought in here, but if you can't get past questionable plot points for the sake of moving the story, look elsewhere. 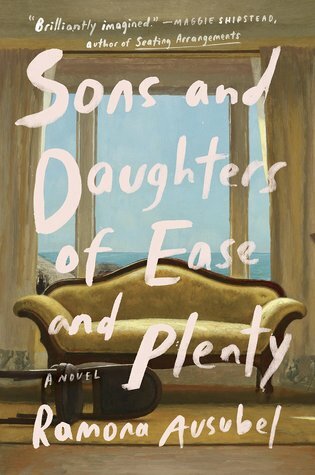 "Sons and Daughters of Ease and Plenty" by Ramona Ausubel, published June 14, 2016 by Riverhead Books.